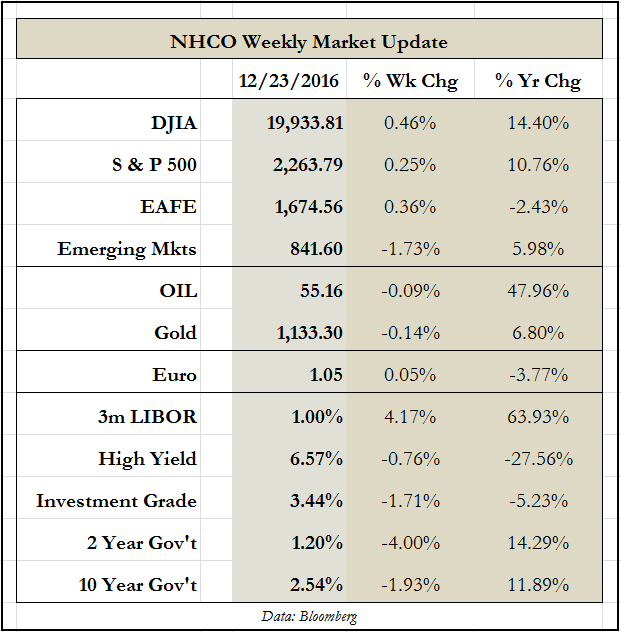 2016 | Nicholas Hoffman & Co.
2016 Forecasts: Naughty Or Nice? Every year, very intelligent and well compensated market professions try to figure out the direction of the market. Most major Wall Street firms then publish such forecasts. Creating a record of your forecast can be a risk, because time will eventually reveal its quality. The end of the year strikes me as good time to grade the people who made market predictions for 2016. This exercise is not meant to discredit anyone, or any firm, but I have learned that looking at these forecasts can be a good way to learn. So let’s look at the list of who was naughty (those who had a poor call on the market) and who was nice (those who actually got it right). First, we should remind ourselves of how we started this year. At the end of 2015, the S&P 500 stood at 2043. The market in 2012, 2013 and 2014 had given investors very good returns, but 2015 posted a meager return of just a bit over 1%. Not surprisingly, the pundits were looking for grey skies to continue in 2016. Here are some of the 2016 predictions that major Wall Street firms made at the start of the year. JP Morgan and BofA Merrill Lynch both called for the S&P 500 to end the year at 2000 (a decline for the year!). The team at Credit Suisse was forecasting a positive return, getting the market all the way to 2050. Others firms were crowded around the 2100 level including Stifel, BMO, and Goldman Sachs. Citibank came in at 2150, while a more optimistic tone was seen at Morgan Stanley and UBS, both predicting 2175. The highest and most bullish call was made by the Barclays team, stretching the goal line to 2200. Just as a reminder, we started at 2043. You might remember that January 2016 turned out to be one of the worst trading months the market had ever faced. The S&P 500 went down, and eventually hit 1810, before it finally stopped in mid February -11.4% for the year. At that point, even those predictions of 2000 seemed overly optimistic. The market began to rally in late February and just kept going up, reaching new all time highs. As of this past Friday, the S&P 500 closed at 2263, up in price 10.7% for the year. Regarding the Barclays 2016 predictions done in late 2015, one of their analysts wrote: “Our macro narrative is simple, if obvious. We believe US interest rates will go up [they got that right] leading to a strong dollar [right again] this should cause earnings per share growth.” Hence their positive outlook for a 2200 call. This entry was posted in Uncategorized on December 27, 2016 by nhoffmanandco.